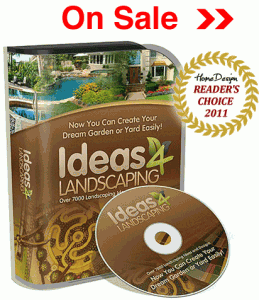 Ideas4Landscaping is a comprehensive multimedia resource for people looking for landscape ideas and inspiration around their own home. Available for download or as a PC CD-ROM you receive a database of over 7000 high resolution images and 300 step-by-step guides, themes and video tutorials. These come in 60+ categories, for landscaping anywhere in the front yard, backyard or garden. The database comes with a 60 day money-back guarantee. For the one-off fee you also receive lifetime membership, support and 24/7 access. I found this a great service being able to log in at various times of the day and see updates as the database grows with content. I really liked the detailed diagrams and easy to follow instructions. The marketing copy says “don’t know where to start?” and that’s the perfect audience. While they says it’s for beginners and pros I think it really suits the hobbyist/enthusiast more than the expert. Great value for money. I have in the past hired landscape gardeners for projects that ended up costing me tens of thousands of dollars. The alternative was reading magazines and hiring different people to do individual jobs. I’m not saying these projects could have been done without professional help, but this resource would have really helped me cut costs and shape my ideas, MY way. In the end and without this knowledge, projects always cost more and took longer than anticipated. For those who buy (frequently or infrequently) different gardening and landscaping magazines, this is a really good resource. Very few magazines have the level of detail and quality guides this database comes with. When you consider it’s half the price of most annual magazine subscription, it’s great value. I really enjoyed looking at the various themes and bonus materials. Especially the “Landscaping Secrets Revealed Guide.” However, the “Save On Energy Costs – Green Home Guide” was a bit basic and “How To Grow Organic Vegetables” wasn’t really of interest to me, but I guess it will be to some. I’ve heard some people say it’s not suitable without an Internet connection, but it works a treat from the CD-ROM too. My main issue with the database is it doesn’t have any real testimonials or use-cases from ‘dummies’ (like me!) showing me how they have got on with the various guides and projects around their own homes. That would have been a superb addition to help those of us that want to be inspired. Most designs and ideas are straightforward to do yourself, but they say most projects can be completed in a week. I would say that’s only true if you know your way around a toolshed! While nothing is so complex you need to be a professional to even attempt it, some of the ideas are intricate and amazing – IF you have the time and dedication to pull them off. My honest opinion is that Ideas4Landscaping is worth buying if you are a landscape gardening enthusiast of any kind. Though not one myself, I would also say it is probably a valuable asset for professional landscapers and gardeners because it is packed with so many fabulous materials to stimulate project ideas. Compared to magazine subscriptions or even one-off purchasers, and certainly compared to hiring a professional landscaper, this is a rich collection of resources. The images and guides alone are a great buy and I look forward to seeing further updates as and when they are available for download. You can learn more about this product or read further reviews by visiting this page. What is the cheapest way to to get this product? You can buy the product from the official distributor on sale by clicking the box to the right – this will entitle you to the full warranty and money-back guarantee. Alternatively, if you wish to post your own feedback, or ask question to our community, please use the comment thread below.